Welcome,i was just on your Site, Very Cool & Well Organized Hope to see more of Your Interesting Stuff! Allow me to introduce myself, my name is Skip Lipman (rn) and I am a storyteller, prop & costume maker. My joys are my family and creating fun and interesting works. I am a filmmaker, and have a new steampunk project that I will detail further in Aural-Ocular. Just wanted to pop in and say, Cheerio! Telling stories of light, hope, and redemption in an ever darkening world. Hello! My name is Tina, also known as Auntie Tina. I recently started blogging and making videos on vintage and antique things. My last post was on decorative compacts. Who knew these clever little things had so many hidden compartments? They reminded me of the gadgets in a the Steampunk novels I read, which led me to wonder how I could combine my interest. So far, I haven't been able to make many connections, but so much of what I have researched finds its origins in the 1800's industrial age. I am open to ideas and suggestions! Meanwhile, I'm going to soak up all the wonderful information on this site and see if it can spark my creativity! Many thanks for the pointer to your site. The article on compacts was fascinating - why aren't they made like that anymore, elegant but with a surfeit of practical compartments? I was forced to make my own (http://brassgoggles.co.uk/forum/index.php/topic,43842.msg933770.html#msg933770). Oh, and a warm welcome to the forum! Skip too - best of luck with getting your film together. Greeting, my esteemed ladies and gentlemen! I go by Quinn, and I came across this gathering of like-minded individuals by chance during a search for inspiration for my various projects. I have long lurked on the edges of the steampunk communities, marveling from afar all of the wonderful things that have been created, and I finally decided to jump in and partake of it in earnest. I won't lie, I still have so much to learn about all of the influences that created this genre, but I've never passed on an opportunity to broaden my horizons and expand my knowledge! Sewing, knitting/crocheting/weaving, writing, and drawing are all my biggest interest currently, and in the two former I intend to share my progress with. In fact, I've been restoring a more modern (1969) flatbed knitting machine, and have plans to modify it aesthetically to resemble something that could have existed in the Victorian Era (the very first knitting machine ever was invented in 1589, in fact). I'm also keenly interested in combining Victorian fashion with tradition Viking and Celtic designs, so expect to see that from me as well! In the interest of not running at the mouth...er, keyboard, I will leave it here. I hope to make a good impression here, and help others in their endeavors whenever I can as well! Welcome aboard, Skip and Quinn. Greetings. Just thought I'd say hi. I have always loved Sci-fi and fantasy stuff and have liked steampunk since I first heard/saw it. I am an artist and paint all the normal stuff but I'm prone to doing the occasional steampunk drawing and art too! Hello and welcome to brass goggles! Sorry for this ridiculously late welcome, but i hope you enjoy your stay! Can we see some of your work? In the words of Mushu from Mulan, "I LIIIIIIIIIIVVVVEEEEEE". It has been about a year since I have been on the forum, and felt it appropriate to reintroduce myself. 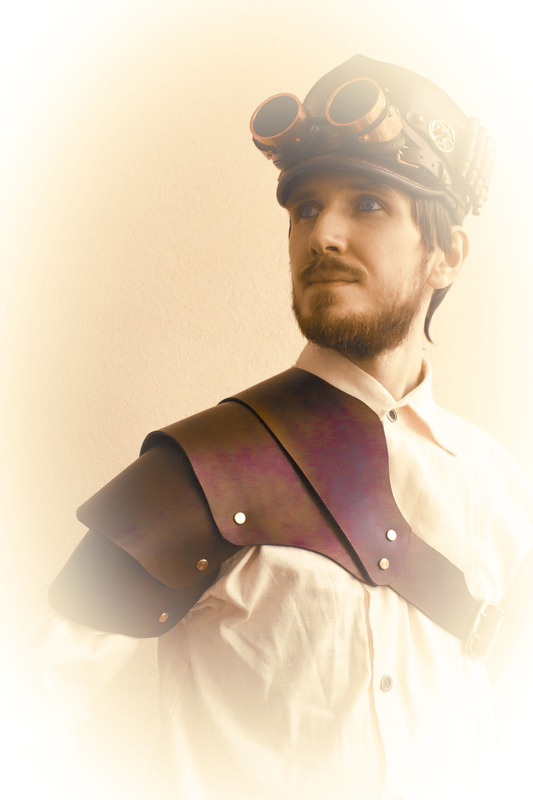 I am Captain Retep Madasa of the Airship Icarus, and I am a lover of steampunk an a frequenter of its events and demonstrations. Welcome aboard Steampunk Away! We are a small custom order shop, creating jewelry, props, costumes, drawings, and models. Email us at steampunkaway@gmail.com to have us create your special order on commission! Have a mechanical day! Should your username now be Steampunk Returns? Greetings fellows inhabitants of somewhere in time. I've join this forum a few days ago so first of all please to meet you and join you! My name is Señorita Ana Rosa Reyes Gutiérrez, para servirles (to serve you). "Guerra guerra en el monte en el valle, los cañones horrisonos truenen y sus ecos sonoros resuenen con las voces de unión, libertad!" Hola and welcome to brass goggles forums! I hope you will enjoy your stay. Looking forward to see moreof you! *snaps out a smart salute* Greetings fellow voyagers of steam! I am MoonlitRain but I respond to Moon, Lit, Train or Rain as well as the occasional "What ho!" I am newly initiated to the ways of steam so please don't haze me too much I am a lover of story telling, all things mechanical and some swash as well as a bit of buckle. Hi, Jerry, and welcome! I'm also madly in love with the beautiful style of steampunk. Good luck with your game! I would love a few more steamy games in the world! I wear goggles so you can't see when I'm staring at you. I'm not sure how to work sites like this or anything. Long story short I'm in collage doing a project and the theme we have been given is steampunk. I enjoy the style but to really do it justice I'm trying to get a i site past the commercial side and see what it's all really about. Could anybody be kind enough to help me with this please. You've come to the right place. We have over a decade of discussion on all of the many aspects of Steampunk. Have a good look around, and then if you need anything clarified, or if you wish to share your conclusions with us, please join in the discussion. You'll find us a generally friendly, courteous and helpful group. Am I correct in thinking that steam punk is a lifestyle as in If you choose to embody it all then its taking the charms of the past as in the simplistic life and mixing them with a ideal future. As in we don't need the modern things and the way the world is going isn't great (my opinion) so with steampunk. It takes the good of the past alters them with the charms of the old macanical things. And politely with old morals rebels against modern ethics? Sorry if I offend I'm trying to get my head around it. No offence taken, first of all a warm welcome to our little world. Could I suggest if you have a bucket load of questions, maybe start a new thread. I've been into Steampunk for years now, and to be honest, I still hav'nt a clue how to define this beast that consumes me into words..... To me, it's kinda like riding a motorbike at high speed, you can't explain or decribe the feeling but somehow you just know it's right, gets the old blood flowing and just puts a big grin on your face. aka...not me. if you have made your thread already, excuse me I should head off there. I think steampunk can be a lot of things. A subculture not in the least. Like Punk the "lifestyle" steampunks might indeed find the modern world dissatisfying. I myself am mainly here not because I do not like technological advancement (agrees the fact that I am on the internet at the moment), but more because I sometimes think the world is a bit boring. steampunk fixes that. makes a more fantastic world image into something closer. I also just like to look fancy. and that's a big group of people as well, that are just here because they like the clothing, like to make things, or just like our sci-fi background. *Opens the door to my tinkerer's workshop and waves to the fancy hats on the street outside* Hi! I am a simple man here at AdventureDepot, and I craft with brass, leather, wood, light and clay in Sweden. I work every day with steampunk for many years now. I have potentially great volumes to contribute to the general steampunk community. I am not all that good at actually taking pictures and saving everything I make. We will see how much I will upload and where and how frequently. I live in isolation most of the time and i like it so. Forum activity can come and go in waves over the years, and I am far from unique in that regard. My steam punk life is focused around the subculture's aesthetic and crafting related elements. I love and work in several aspects with all kinds of styles within that, the pirate, the explorer, the captain, the aristocrat, the scientist and mainly the mechanic. Some of you might see me as part of the common rabble for merely pretending to be aristocrat among you, and you are sure right, but once I do pretend you would never know, as with all the other times before today. Today I solved a way to store dense Aether for travel, also made yet another common filament lamp. Thus I love all kinds of physical steampunk design. I am not versed with steampunk in most other areas such as text or music. Oh, and also a photo, might be a better introduction to add such with it. Heya, AdventureDepot. I trust you will find Inspiration, likeminded people and maybe even friends at BG! I hope to see a lot more of you on this forum. also, that picture is amazing.